As well as being known for it’s tours, Colorado is famed for it’s challenging and technical ski lines, ranging from 30 to 50+ degrees in steepness, and featuring some of the most thrilling drops in the West. A couloir is a steep, narrow gully that cuts down the mountain at an angle, making it an enticing challenge for both climbers and skiers. Among Colorado’s peaks, the couloirs represent a skier’s true challenge: to make quick and tight turns in a small space, and keep speed, all while navigating variable snow and increasing steepness. Because of the steepness, many couloirs are extremely avalanche prone, and are ridable on mature snow in the mid to late spring. 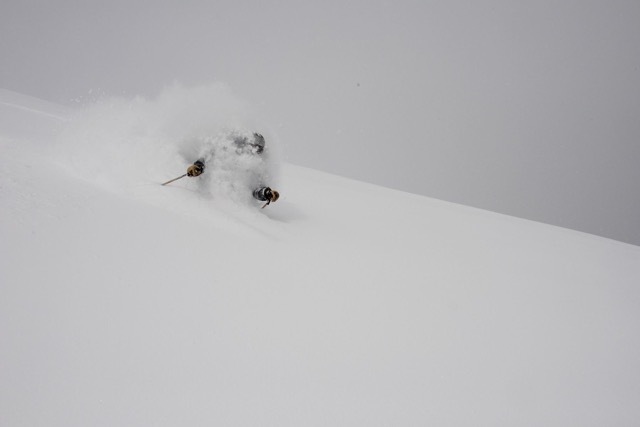 Here are some of the most classic couloir lines in Colorado. A great introduction to couloir skiing, the Cristo Couloir rides off the summit of Quandary Peak and drops over 2,000-feet to the dam below. The couloir can be skied by hiking up Quandary’s standard route and coming off the summit or the couloir itself can be climbed directly to the summit in about three hours. The couloir tops out at about 30 to 35 degrees in steepness, comparable to a black or double black at a resort. While the route is wide, like many couloirs it’s not recommended for a beginner backcountry skier, as much of the route demands expert knowledge of riding sustained steep variable snow and avoiding obstacles. For the veteran backcountry skier who is looking for the 14er skiing experience, the Cristo is a great introduction to high altitude couloir skiing. Coming off the top of Torreys Peak, Dead Dog Couloir starts at a no-fall zone 60-degree angle and then mellows to 45-50 degrees in a tight notch that rides all the way to the base of the peak. Skiers have two ways to enter: The first coming off the Kelso Ridge, an exciting climb on it’s own, and the other riding the East Face and then entering the couloir from high above. With its east facing slopes, the Dead Dog is best ridden in the late spring and early summer and early in the morning, with a recommended drop-in time between 7 and 9 am before the slopes get too melted. This is a great ride for more experienced riders looking for a thrilling ski off a classic line and an iconic peak. Front Range Ski Tours – Experience the backcountry! Set on Buffalo Mountain in the magnificent Gore Range just outside of Silverthorne, the Silver Couloir is a delightfully wide gully that enters directly from the summit of the peak. The route to the summit is a steep, but enjoyable tour, climbing and switch backing through the timberline before reaching the summit of Buffalo Peak. From here, skiers drop into the Y-shaped feature and then enjoy a long ride to the base. The riding is mostly mellow, save for a few spots where it may briefly steepen to about 45-degrees. With its wide-berth and fun riding, the Silver Couloir is a committing but less-intense overall experience. Great for intermediate to expert riders. Rocky Mountain National Park is full of some of the most classic couloir drops in the state, set in a spectacular alpine wilderness, and featuring drops for all levels of experienced backcountry skiers. The southeast-facing Notchtop Couloir, coming off the summit of the titular peak, rides at about 45-50 degrees, descending more than 1,800-feet to the valley floor. The thrilling climb and descent is one of several lines that make up the Ptarmigan Headwall, with the lowest angle that goes at just over 30-degrees, or the typical black and double-black diamond run at the resort. Starting at high altitude, from about 12,000-feet, skiers find will make tight turns in a narrow space. Because of it’s south-facing position, it’s recommended to ride late in the season and early in the morning. The dream of many Colorado ski mountaineers is to ski Longs Peak, the proudest and tallest peak of Rocky Mountain National Park. The spectacular east face, set on top of Chasm Lake and flanking the Diamond Face, is rife with a number of lines for the highly experienced ski mountaineer, with steep, technical lines that start at 35-degrees and steepen all the way to 50. This is a line that requires Class-3 and Class-4 hiking to the near summit, and then a long, thrilling, and complex ride to the bottom. Dropping in, skiers have to make some Class-4 down climbing movies, and then start skiing making turns at about 40-degrees. The Loft Couloir is only for the highly experienced ski mountaineer who is familiar with some technical rock climbing moves and the capacity to endure a long sustained line. A local favorite, the Dragon’s Tail Couloir is the perennial beloved classic of Rocky Mountain National Park. Set above the spectacular Emerald Lake, this line climbs up for over 1,600-feet above the valley, and is a much vaunted objective in the spring. There are two entrances: The first skinning to the top of Flattop Peak and dropping into the top, or climbing the couloir itself, which involves navigating the steep cornice at the top. Dropping in skiers may ski the classic steep line or the alternate mellower drop, which involves an exposed traverse. The run stays at a sustained 30-degrees, making it one of the best springtime drops, and one of the most classic lines in Rocky Mountain National Park. Climb up a couloir, have a donut at the summit, then ski down? Living the dream. With a short approach, the Y-Couloir is the classic ski line on Pikes Peak in Colorado Springs, with just over 1,300 feet of descent, and a fun climb up as it is a ski down. 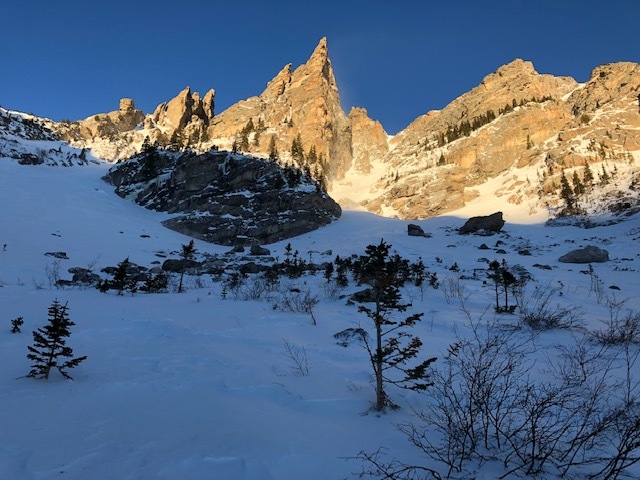 The climb starts with several short exposed traverses through rock bands before meeting the main couloir and finding the most direct line to the summit. The climb is best in the mid to late spring when the snow is firm. After reaching the summit, take a break at the iconic donut shop, probably the most unique ski mountaineering feature anywhere in North America. Dropping into the couloir, skiers will ride angles from 30 to just under 40 degrees at it’s most, with an average slope angle of about 35, mirroring the hardest runs at the resort. Without any true technical obstacles, this is one of the most classic and accessible of the 14er couloirs. Outside of Rocky Mountain National Park, the Indian Peaks Wilderness is rife with ski mountaineering opportunities, with summits, couloirs, classic tours, and a multitude of fun lines. The Queens Way Couloir off Apache Peak is set above Isabelle Glacier and Lake Isabelle, with just around 1,200-feet of descent. Starting at the Long Lake Trailhead, skiers hike to Lake Isabelle and then begin a switch-backing climb up to the glacier. In the later spring and early summer the glacier itself is open and fun for laps. Heading looker’s left, Queens Way Couloir is the obvious line to the left with a stout but steep climb and a fun ski. Queen’s Way is best skied in the early to mid spring, as the late spring and early summer will melt out sections and disconnect crucial segments. With a long hike in and descent, Queens Way is one of the classics of the Indian Peaks Wilderness. The force is strong with this one. From the summit of South Arapahoe Peak, this ultra-classic line is a beloved Front Range line that starts off as steep at around 55-degrees and drops almost 1,900-feet to the base. Long, sustained, fun, and technical, Skywalker is SW facing and best for later in the day when the sun has slightly melted out. Steep and committing, the Skywalker Couloir is meant for the expert ski mountaineer, confident in their abilities to make tight turns in narrow spaces and ski variable snow conditions. There are two ways to enter the couloir: to climb it from the bottom and top out on South Arapahoe Peak from the Fourth of July Trailhead or to climb South Arapahoe from the trailhead and then drop in from the top. After riding this fun, sustained line, you could say that you’ve skied one of the ultra-classics of the Front Range. And may the force be with you. As you come up and over St. Mary’s Glacier, and James Peak comes into view, you have a look at the main line over the ridge and a number of smaller notches all coming off the summit. The most classic of these lines is the Shooting Star Couloir, which drops just over 1,100-feet to the glacier at a sustained angle of about 45 degrees starting with a 60 degree rollover and slowly mellowing out towards the bottom. The entry is narrow and demands careful and precise skiing. This is one of the most classic lines in the James Peak Wilderness, demanding expert skiing in changing snow conditions. If there were any line in Colorado that could get points for aesthetics alone, as well as being a superb ski, the Holy Cross Couloir would be in the top 3. If not, number one alone. Cutting right through the center of Mount of the Holy Cross, this line, dropping in at just over 1,400-feet and ranging from 27 to 40 degrees in steepness, drops in from the summit of the titular peak, named because of it’s iconic cross like gully that cuts down the face. Skiers start by climbing the peak to the summit and then dropping into the Bowl of Tears, where they are able to link up with the cross and ride it all the way down to the bottom of the basin. After coming off the couloir you get a spectacular open ride down the East Face back to Half Moon Pass. 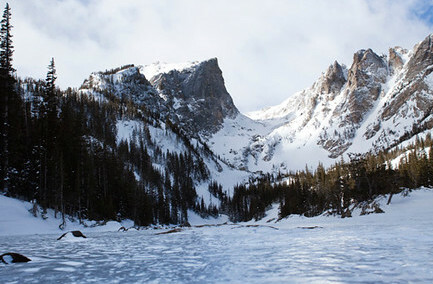 Colorado Wilderness Rides and Guides are the experts in skiing the Front Range. We’ll take you on your dream descent, whether it be in Rocky Mountain National Park or the Indian Peaks Wilderness and beyond. Join us in booking your ultimate dream trip. Call 720 242 9828 to book your trip today!